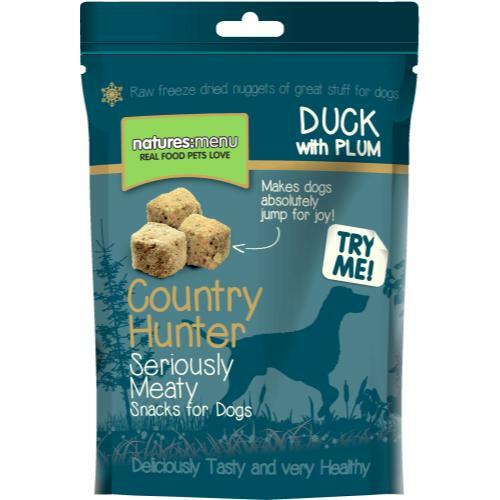 Natures Menu Country Hunter dog treats are mouth watering delicacies made with raw meat which is freeze dried to seal in nutrients and flavour. Free from artificial additives, flavourings, and preservatives as well as sugars, Country Hunter treats are all made with high quality cuts of nutrient rich meat, as well as fresh fruit chock full of antioxidants. Free from wheat and other grains, gluten, the resealable packs are perfect for popping in your pocket before long walks, keeping the last treat every bit as succulent and fresh as the first. Duck with Plum: Duck (60%), Peas (10%), Swede (10%), Carrots (7%), Apples (5%), Plum (4%), Seaweed (1%), Spinach (1%), Yucca Extract, Green Tea Extract, Grape Seed Extract, Yeast Extract, Dicalcium Phosphate, Calcium Carbonate. Rabbit with Cranberry: Rabbit (60%), Peas (10%), Swede (10%), Carrots (7%), Apples (5%), Cranberry (4%), Seaweed (1%), Spinach (1%), Yucca Extract, Green Tea Extract, Grape Seed Extract, Yeast Extract, Dicalcium Phosphate, Calcium Carbonate. Venison with Blueberries: Venison (60%), Peas (10%), Swede (10%), Carrots (7%), Apples (5%), Blueberries (4%), Seaweed (1%), Spinach (1%), Yucca Extract, Green Tea Extract, Grape Seed Extract, Yeast Extract, Dicalcium Phosphate, Calcium Carbonate. Protein 42%, Crude Oils & Fats 19%, Crude Ash 15% (7% for Venison treats), Crude Fibres 3%, Moisture 4%.